The people who inhabited the cliff dwellings at Mesa Verde centuries ago probably never had a fear of heights. Or claustrophobia. To reach the ancient sites, visitors must descend deep into the canyon, then climb a steep 32 foot tall ladder to enter the homes. From there, it's several narrow passages - including one section that can only be negotiated on hands and knees - followed by tiny rooms that verge on the cliff face, and a final 60 foot ascent on ladders and skinny stone steps to get out of the ruins. 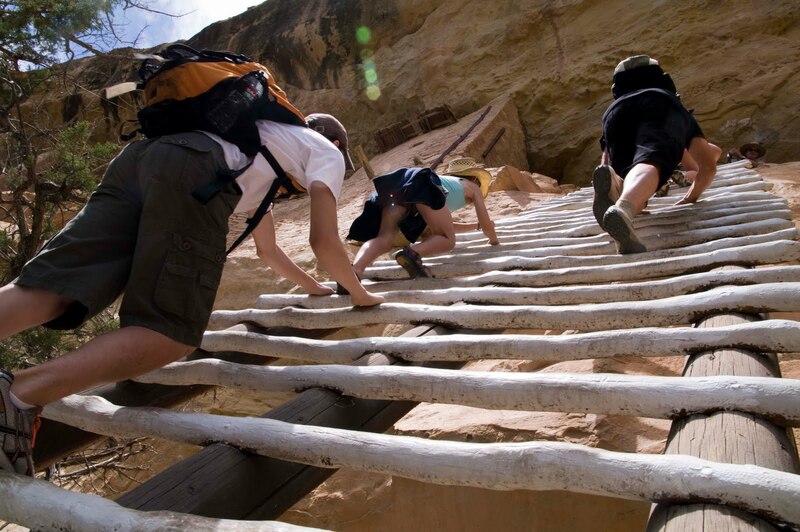 Years ago at Mesa Verde, there was a sign that the guard rails were removed the next 17 miles. I remember spending my time there worrying about the trip out. Made an impression! The girls climbed into a kiva. Great angle on your shot.